Home | News | General | 'I remain Osun governor' - APC's Gboyega Oyetola brags! 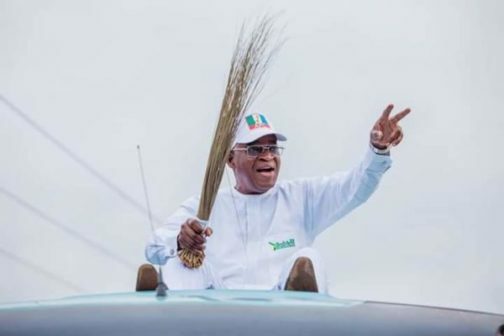 Osun State Governor, Gboyega Oyetola, on Saturday, said he remained the duly elected governor of the state regardless of Friday’s judgement of the state Election Petitions Tribunal. Oyetola enjoined the public to disregard the insinuations that he had been sacked, saying he was confident of retaining his mandate at the appellate court. He spoke in Osogbo while inspecting some ongoing road and drainage projects in the state capital. The governor said the outcome of the lower court did not, in any way, affect the validity of the votes freely and willingly given to him by the people of the state. He said since the constitution allowed him to file an appeal against the judgement, he remained the legitimate governor of the state. The governor, who had earlier received the leaders and members of the All Progressives Congress at the Government House, assured the supporters of the party that he would become victorious at the end of the litigation. He called on the party loyalists to remain calm and expressed confidence in the judiciary to deliver justice.